And got people to these print words around the image. The responses I got were great. Early on a woman asked me to help her put ‘fondness for 65 years of visits’. I asked how she thought it had changed which she told me. She told me it used to have a specific smell, of well polished floors and old books. And that even when she moved away from York she would dream of the library and this distinct aroma. But she said that smell has given way for coffee and cheese on toast. Following her was a young child and his Dad, who printed and captured in bright green ‘first time’, as it was his very first time in the library. 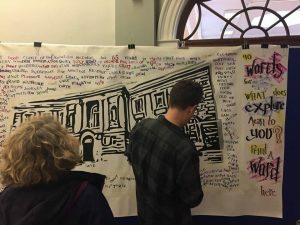 For several hours, people shared their memories, names of favorite books, ideas, thoughts and some frustrations too about how important the library is to them. Even a Manics lyric made it in ‘libraries gave us power’ and lots of other interesting chat about how significant the library is as a community space and place, that you can come along, read, learn, think, plan and most importantly just be. Over the next few months I’m going to be working with Explore to develop a larger piece. My idea is create a group print pop art style piece made up of 90 small block prints of the library. This will be done colourfully on a large sheet by people in the library. 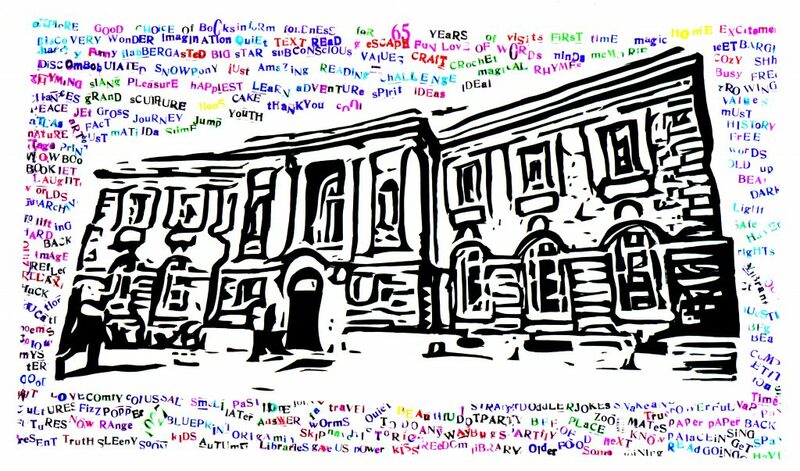 Each print will include a word, about what the library means to them and will be duplicated, one on the big piece and one individual one for each person to keep. The words will be printed from a block printing alphabet made from peoples handwriting. To develop this I also hope to collaborate with fellow artist in residence Alun Kirby to engage with other library sites in York. Through this we are hoping to capture some of the history and power of people interacting with these wonderful library spaces. Previous Previous post: Once Seen Theatre, York.